Failaka (also transcribed as Failakah or Faylakah, and locally known by the names Feileche, Feiliche or Feliche), in antiquity known as Ikaros was mentioned by the Geographer Strabo in ca. 25 AD and later by Arrian. It is the second biggest offshore island of Kuwait situated at the entrance to Kuwait Bay ca. 16 – 17 km far from Ras Al-Ardh in Salmiya and ca. 12 km from Ras As-Sabbiya. It blocks access to the Bay opposite the mouths of the Tigris and Euphrates (Shatt Al-Arab). Failaka has attracted the attention of researchers since 1957 when Danish archaeologists first had the opportunity to study material from the island received from a member of the British political representation to Kuwait. According to the results of up-to-date archaeological research, the ancient history of Failaka goes back to the beginning of the second millennium BC – to the Bronze Age when the Dilmun cultural phenomenon occupied the western shoreline and islands of the Arabian Gulf. The Dilmun monuments are the most significant antiquities of the history of Failaka and Kuwait. Major Bronze Age sites on Failaka are located on its south-west (Tell Sa’ad/F3; F6; G3), north-west (Al-Khidr) and north-east (Al-Awazim) coasts, one perhaps even being located in the south-east (Al-Sed Al-Aaliy/Matitah) part of the island [6,14]. During the Bronze Age the temple of the god Inzak, tutelary god of Dilmun, existed on Failaka as it is mentioned in the cuneiform and Proto-Aramaic inscriptions on vessel fragments, Dilmun stamp seals and slabs from excavations . In F6, the French excavations revealed buildings interpreted as a tower temple and palace . After the most flourishing Early Dilmun period (first third of the second millennium BC), Failaka remained settled until the mid second millennium, during the so-called Kassite period . There is no significant evidence for the habitation of Failaka during later periods; from the Iron Age only a single jar-burial is known . Another peak in the history of Failaka was the Hellenistic period when the travellers of Alexander the Great reached the island [3,9]. The Seleucids built a fort at the south-western edge of the island (Tell Sa’id/F5) and occupied also its surroundings for buildings of different purposes (F4; B6), using the ruins and suitable location of the Bronze Age Dilmun settlement. Within F5 a temple was unearthed and an important commemorative monument was found – a stone slab with an inscription mentioning Ikaros, the first historically documented name of Failaka that was given to the island by command of Alexander himself [4,9,11]. Another Hellenistic site (Tell Al-Khazneh) is situated around 0.5 km north-north-east of the archaeological sites at Tell Sa’ad wa Sa’id. This site is known as the discovery spot of the so-called Soteles stone – classical Greek dedication slab with an inscription in Greek of an Athenian Soteles and his companions to the Greek gods [2,15]. With the collapse of the Seleucid power, the Hellenistic sites at F5, F4, B6 and Tell Al-Khazneh were probably abandoned, even though F5 and B6 could have been resettled even in the post-Seleucid era during the 1st century BC [10,12,16]. From the following historical epochs, the Late Pre-Islamic Period is important for Failaka. During the 5th/6th – 7th/8th cent. AD  a large village existed in the middle of the island, in the location known as Al-Qusur. An agriculturally suitable area of ca. 5 km2 was settled during that time. Al-Qusur was first described and excavated by the Italian mission in 1976 , in 1989 the French mission discovered and excavated a church in the centre of the village . This formed the focal part of a Nestorian Christian community which lived on the island. In 2006, KSAM resumed activities here and began detailed mapping and survey of the southern and south-western parts of the settlement. The inhabitants of Al-Qusur lived in farmsteads, each with a habitation and activity area. Around 140 such units have been recognized within the whole village. 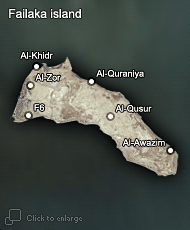 The situation in the Gulf probably changed after the Early Islamic Period and from the strategic point of view it became more convenient to establish settlements not within the interior of the island but on the shoreline as it is shown by the location of the Middle and Late Islamic Period site of Al-Quraniya. Such a strategy is retained until the modern era when the northern, western and southern shorelines of the island remained or became settled in the locations Al-Quraniya, Al-Zor, Kharaib Al-Dasht, Umm Al-Dakhan, Al-Subahiya and elsewhere . Bernard, V. - Callot, O. - Salles, J.-F. 1999: Al-Qusur church at Failaka, State of Kuwait, 1989. Original report translated to Arabic by Khaloud Al-Salem. Bibby, G. 1969: Looking for Dilmun. New York, 248 sqq. Callot, O. - Calvet, Y. 1999: Preliminary report on the topographical mission at Failaka, Kuwait (February 26 - March 25 1999). Unpublished report, NCCAL. Calvet, Y. - Pic, M. 1986: Un nouveau batiment de l'age du bronze sur le tell F6. In: Calvet, Y. - Salles, J.-F. (sous la dir. ): Failaka. Fouilles Françaises 1984 - 1985. Lyon - Paris, 13-87. Calvet, Y. - Pic, M. 1990: Un temple-tour de l'age du bronze a Failaka. In: Calvet, Y. - Gachet, J. (sous la dir. ): Failaka. Fouilles Françaises 1986 - 1988. Lyon - Paris, 103-122. Calvet, Y. 1984: Ikaros: Testimonia. In: Salles, J.-F. (sous la dir. ): Failaka. Fouilles Françaises 1983. Lyon - Paris, 21-29. Caubet, A. - Salles, J.-F. 1984: Le sanctuaire hellénistique (B6). In: Salles, J.-F. (sous la dir. ): Failaka. Fouilles Françaises 1983. Lyon - Paris, 73-156. Gachet, J. - Salles, J.-F. 1986: Chantier F5: Rapport préliminaire, 1985. In: Calvet, Y. - Salles, J.-F. (sous la dir. ): Failaka. Fouilles Françaises 1984 - 1985. Lyon - Paris, 297-333. Gachet, J. 1990: Un habitat du IIe siecle av. J.-C. dans la fortresse de Failaka. In: Calvet, Y. - Gachet, J. (sous la dir. ): Failaka. Fouilles Françaises 1986 - 1988. Lyon - Paris, 167-208. Højlund, F. 1987 : Failaka/Dilmun. The Second Millenium Settlements. Volume 2. The Bronze Age Pottery. Aaarhus - Kuwait. Patitucci, S. - Uggeri, G. 1984: Failakah. Insediamenti Islamici. Ricerche e scavi nel Kuwait. Rome. Salles, J.-F. 1986: Les Fouilles de Tell Khazneh. In: Calvet, Y. - Salles, J.-F. (sous la dir. ): Failaka. Fouilles Françaises 1984 - 1985. Lyon - Paris, 107. Salles, J.-F. 1990: Questioning the BI-ware. In: Calvet, Y. - Gachet, J. (sous la dir. ): Failaka. Fouilles Françaises 1986 - 1988. Lyon - Paris, 303-334.